Speeding and motor vehicle accidents often go hand in hand. Drivers who speed are far more likely to be involved in a collision, and are far more likely to be injured in a collision. Speed limits are enforced to varying degrees, depending on the roadway and responsible police force. Speed limits can also themselves vary greatly. Even within Alberta, the speed limits that are assigned to streets may differ depending on where you are in the province. For example, in Calgary, most urban streets have a default speed limit of 50 km/h. Many streets have speed limits that are much higher, of course, like Deerfoot Trail, which, unsurprisingly, is one of the most dangerous streets to drive in the city. 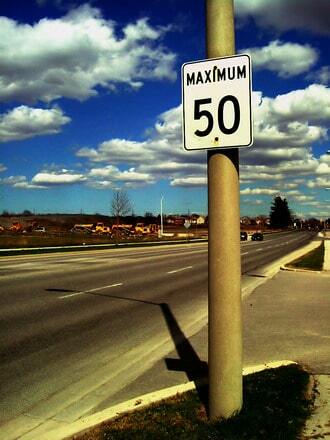 In Airdrie, on the other hand, many residential areas have a maximum speed limit of 30 km/h. This might seem slow for some people, especially new visitors to the area, but the community is not alone in choosing to reduce the speeds of drivers. Several communities in Edmonton also have a lower speed limit at 40 km/h, a decrease which came in 2010. Banff lowered its residential speed limit to 40 km/h in 2003. In addition to the potential of getting an unwanted speeding ticket with the hefty fine and demerit points, speeding is dangerous – plain and simple. Speed limits are posted for good reasons; if drivers would obey speed limits, many accidents and injuries would be prevented, and lives would be saved. Studies suggest that speed is a contributing factor in 12% of all motor vehicle accidents, and 30% of motor vehicle accidents which result in death. Additionally, these studies show you are four times more likely to be killed in a vehicle that is travelling at 120 km/h than you are in a vehicle that is travelling at 100 km/h. Even driving only 10 km/h over the speed limit increases your risk of injury in a car crash by 73%. However, an estimated seven out of 10 Canadians admit to speeding, despite the serious dangers of doing so. Whatever the posted speed limit is in a given area, however, drivers should always adjust their speeds to match the driving conditions. The posted speed limit on Deerfoot Trail in Calgary is 110 km/h in certain places, but when traffic is heavy, or visibility or road conditions are less than ideal, it is not safe to drive at that posted speed – slow down and help prevent accidents, injuries and death!